As Justin Shubow, president of the National Civic Art Society, said at a press conference Wednesday, "this is an entirely inappropriate memorial for a great president; it is a travesty, and it must be stopped." A final, superficial design change to the Gehry memorial, a new image for the "tapestry," was approved by the U.S. Commission of Fine Arts Wednesday morning. Example portions of the weave were on display outside the LBJ building. The National Civic Arts Society organized a press conference to castigate the decision, the design, and the cable mess hanging from a crane above construction workers who seemed uncertain of why they were still on the scene. 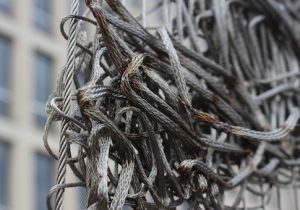 "Up close it looks like a tangled rat's nest, and we predict that it will rust over time," Shubow said. "You could see already what they call ‘rouging' at the wells, discoloration—it looks pretty bad already and it's just brand new." The next step in the protracted bureaucratic ordeal bringing this sprawl to life is the approval by the National Capital Planning Commission of the new tapestry design. The commission's chairman, L. Preston Bryant Jr., told me a staff recommendation will be made public September 29. 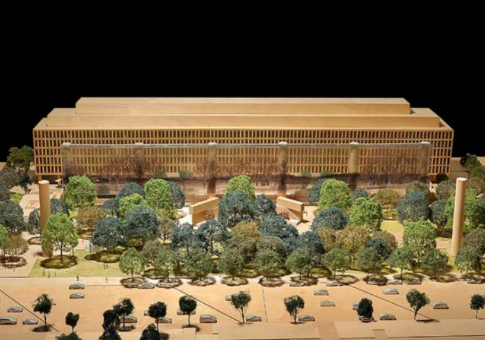 Bryant emphasized that the NCPC is primarily concerned with material considerations, rather than aesthetic, and that they have already given final approval for Gehry's overall design. They will only be voting to approve the change to the tapestry. Which means that if the Gehry design is to be scrapped and something more like a monument and less like a disappointing sculpture garden is to be built, it will be up to Secretary of the Interior Ryan Zinke to decline to sign off on the project, on his own judgment or by direction of President Trump. As it stands, Normans wishing to pay their respects with a salute, as I have seen their school children taught to in the cemetery at Omaha beach, will have to pick out one of three relatively small statues of Eisenhower placed about the four-acre sprawl. In contrast, you cannot get lost in or miss the Lincoln Memorial, which is only half that size and restrains itself to just one, admittedly enormous, statue. The Eisenhower Memorial will, in the immortal words of Patrick Swayze, put baby in a corner: A statue of Ike as a young man will sit on a cube near the intersection of 6th St and Independence Ave. SW, while the other two statues, Ike the president and Ike the general, will stand somewhat more focally beneath the steel netting. But barring a map telling them there is something to see here, tourists and commuters spilling forth from nearby L'Enfant Plaza Metro will wander beneath the vast steel mesh twixt towering columns on their way elsewhere and only perhaps pause for a moment to register a statue or three and maybe even realize who it is. The "tapestry," the real focus of the design, has changed much over the memorial's troubled development. It was at one point to be a landscape from Ike's native Abilene, Kansas, to go with the Ike as barefoot boy statue Gehry had originally wanted to emphasize. 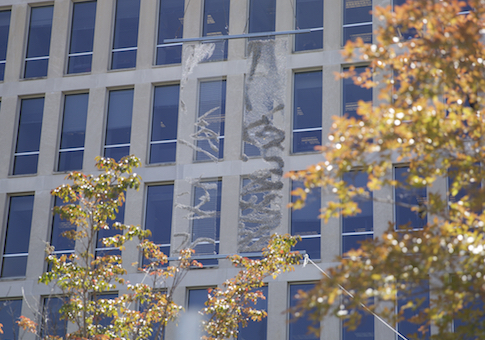 The Eisenhower family objected to this discarding of the man's accomplishments and so the scrim was changed to depict, in the words of Bruce Cole, a President Obama-appointed member of the Eisenhower Memorial Commission and longtime objector to Gehry's design, "a barely recognizable depiction of the Normandy beaches, not at D-Day, but inexplicably today." Upon further debate and concern about legibility and transparency and durability from various corners and committees, that design has been further changed to something called the "Cliffs of Pointe du Hoc," which means that if you squint it might look like you're close to some rocks. "I and hundreds of others consider this design not befitting of Ike's modesty and sense of decorum," Cole said. To illustrate Eisenhower's sense of decorum, the National Civic Art Society's chairman Marion Smith quoted from Ike's 1962 remarks at the dedication of his presidential library: "Do you think that America has advanced morally as we have materially? When we see our very art forms so changed that we seem to have forgotten the works of Michelangelo and Leonardo da Vinci … is this improvement? What has happened to our concept of beauty and decency and morality?" Catesby Leigh, art and architecture critic, described the design as entirely missing the formal resolution and symbolic focus found in Washington's great monuments, and more a memorial theme park than a memorial in a park. "In commemorative art, symbolism involves the distillation of great personalities, events, or ideals in formally resonant, spatially compact, essentially non-narrative forms," Leigh said. "The further away we get from symbolically oriented design the further we stray into the swamp of memorial sprawl. Mr. Gehry's design is exhibit A." This entry was posted in Culture and tagged Eisenhower, Feature. Bookmark the permalink.